Man, I remember a time when the NBA draft used to be an event for me. I had a BBQ back in Philly in '96 draft when my Sixers selected Iverson with the #1 pick. For the '98 draft the Wachovia Center had a draft day event with food (including cheesesteaks...you gotta LOVE Philly) and drinks when we drafted Larry Hughes with the #8 pick. Hell, one of me and my wife's first dates was going to the '99 at the Verizon Center in D.C. cause I wanted to see my dude Steve Francis get drafted. 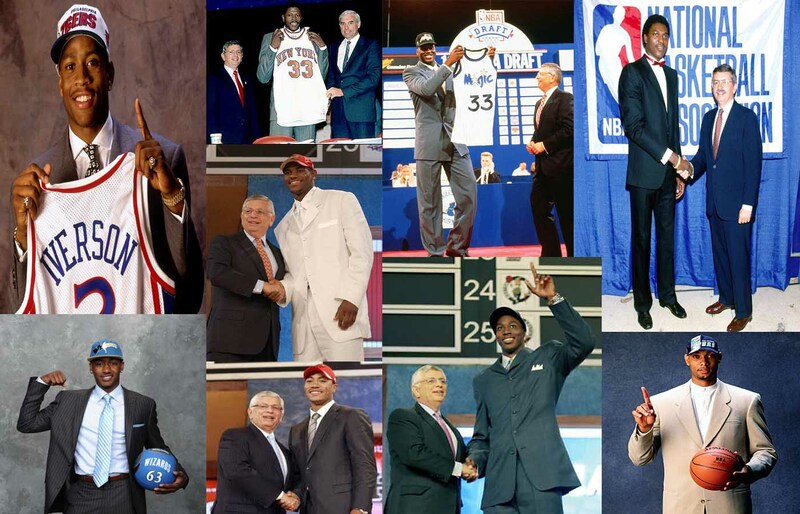 But nowadays who even cares about the NBA Draft anymore? The talent level for the draft has dropped SO bad that I literally forgot that Evan Turner was the #2 pick in the draft 2 years ago! (and he plays like a late 1st round/early 2nd round pick) And can ANYBODY name who was drafted after Evan Turner? And where money plays now. Probably not. The part that kills me about the 2012 draft is that MAD comentators are talking about this is a deep draft...WTF?!?!?! After Anthony Davis (who I think if he's lucky, he'll be a poor man's K.G.) the rest of this draft is just up in the air and whoever says differently just doesn't know ball. (or they're on David Stern's payroll) Now you got some new dude Brandley Beal outta Florida who all of a sudden commentators are calling "the next Ray Allen"...WTF?!?!? First things first, I LOVE college hoops much more then I love the NBA. And from watching college ball all last year, I haven't heard one human being, alien, dog or cat say this dude shoots ANYTHING like Ray Allen. Now all of a sudden he's the next Jesus Shuttlesworth?!?!? Really?!?!? And when Kendall Marshall is probably gonna be the first point taken in the draft...you KNOW it's gonna be a bad draft. Then I read on a draft board article on ESPN where the writer was saying that Charlotte should take Andre Drummond with the #2 pick...REALLY?!?!?! Don't forget I bleed Uconn blue & white, so if anybody (as far as cats who watch college ball) knows Drummond's game, it's me. And to be honest, money has no game. Money has a RACK of potential but currently...no game. Do cats remember what he scored for us when we lost in the 1st round of the tourney? Let me refresh your memory. Money had 2 points, 3 rebounds and 4 blocks. Did ya'll get that...2 points! This dude is 6'10" and ALL he gave us was 2 points in a tourney game and somebody has the audacity to even form their lips to say "take this dude with the #2 pick?" But if anyone is dumb enough to take him with the #2 pick, it would be the Bobcats.